Top military research specialists have been called in to help with a major decontamination operation after 150 mustard gas canisters were uncovered. Porton Down specialists were brought in after the discovery near Woodhall Spa, Lincolnshire on 1 October. Two people sustained minor burns and three people arrested on suspicion of possessing a noxious substance have been bailed until the end of the month. A local council said some of the mustard gas had leaked into the soil. Stuart Davy, chief executive of East Lindsey District Council, said: "It's not regarded to be a massive area by any means. "But, certainly where [the leakage has] happened we need to identify where that is and remove the soil, have the soil dealt with through Porton Down, incinerate it and bring in some clean soil in order to put the site back to its proper condition." 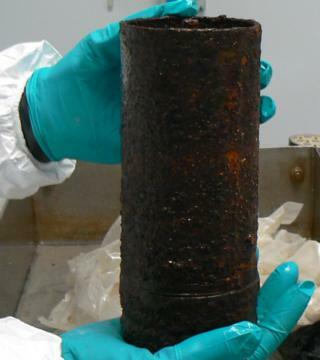 Also known as the Defence Science and Technology Laboratory, Porton Down has been working with the Ministry of Defence (MoD), Royal Navy and Army bomb disposal teams to remove the canisters, which were found in Roughton Moor Woods and Stixwould Lake. The area remains sealed off and the BBC understands the whole process could take "many months". Details of the cost of the operation have not yet been disclosed but the authority said it would be covered by the MoD. A woman and two men were arrested after the initial find earlier this month. The canisters found at Roughton Moor are believed to be from an RAF station and military base which was on the site from 1942 until it closed in the late 1960s. Mustard gas was used as a weapon during World War One and outlawed by the Geneva Protocol of 1925. The people burnt when they unearthed canisters had been digging for vintage bottles in the woods. How deadly was the poison gas of WW1?